In the Masked City, Irene saves Kai from a high Chaos world, having to abandon her role as Librarian to do so. At the start of The Burning Page Irene is on probation and given the lowest level of book recovering jobs because of that decision. She and Kai on one of those jobs in another world finds the door to the Library booby trapped and discover that Library doors all over the universe are being destroyed, and Librarians along with them. Their arch nemesis Alberich is to blame and Irene and her friends take it upon themselves to stop him before he destroys the Library. We have seen Irene grow from a woman who was all business, not wanting friendships or close ties, to a woman who cares deeply for the people around her. In the Burning Page, Irene takes her feelings for both men in her life to another level. She cares deeply for Kai and has slotted him in the “apprentice” and untouchable category, yet she comes closer to revealing those feelings to herself. Yet she also has a tendre for Vale, the Sherlockian investigator, who at risk to himself, helped them out of The Masked City. He is now infected with levels of chaos that he is having trouble dealing with, becoming more addicted to morphine in order to put his mind at rest. It takes all of their combined efforts to stop Alberich giving each of them purpose and allowing them to look beyond themselves to save the Library. 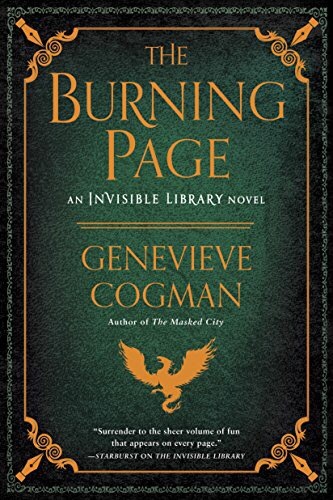 If you have not read the Invisible Library or The Masked City, I would highly recommend starting at the beginning as this is a continuing storyline. These are excellent mysteries set in Victorian London, but a fantastical London that can only be found in Genevieve Cogman’s imagination. This novel felt like a conclusion to the storyline but left the door open for Alberich to make a return and I feel like we have more of Irene to discover, and certainly more books to recover. i received a copy of this book through NetGalley for my honest review. Read my interview with Genevieve Cogman HERE. Buy it on Amazon, Barnes and Noble and Kobo! I love this series, I can’t wait to get my hands on book 3. The joys of reading about an invisible library in Victorian London are boundless. What an imagination Genevieve Cogman has. I’d love to be a spy in her world! Did you read my interview with the author? She’s uber bright and it was interesting to hear about her influences in writing this series. Thanks for commenting!